Nothing happens until the radiology report is signed. For the last several years, that truism has been a driving factor in decreasing turnaround times between image acquisition and reporting. With advances in technology and the rise of teleradiology driving turnaround expectations, waiting a day or even several hours for a report is often unacceptable. At the same time, imaging volumes are continuously growing and radiologists are hard-pressed to keep up. To illustrate the current state of affairs, David L. Weiss, MD, an associate professor of radiology and physician coordinator of imaging informatics at the Virginia Tech Carilion School of Medicine, says he recently heard about a patient who had a study done in the middle of the night and was upset because she had to wait 20 minutes for the teleradiology read from Australia. Now that referring physicians have nearly instantaneous access to images, they also know instantaneously when there’s a blank space where the report should be. Weiss, who is also an advisor to speech recognition provider Nuance Communications, spoke recently at the HIMSS annual meeting about improving communication in radiology workflow. (He will speak on the same topic at the Society for Imaging Informatics in Medicine annual meeting in June.) He says that to maximize their efficiency, radiologists need a single point of contact with their viewing and reporting systems. While he’s not the first person to promote this idea—he cites Steven Horii, MD, of the University of Pennsylvania, and Keith Dreyer, DO, of Massachusetts General Hospital, as earlier proponents—Weiss believes the concept is still evolving. Software enabling decision support, more structured reporting, and data retrieval from all modalities will benefit both radiologists and referrers. On the radiologist side, hunting for patient information in an EMR is a significant time drain. Weiss says it would be more helpful if the EMR could access existing data and provide relevant information to the radiologist. For example, if the radiologist is protocoling a CT exam, he or she specifically wants to know the patient’s blood urea nitrogen and creatinine levels. Weiss says some EMRs and other third-party software products are beginning to use data intelligence to achieve this level of functionality, but the processes are still in the early stages. On the referrer side, although clinicians can access images in the EMR, they may have to scroll through hundreds of images in a single case to find the one that’s relevant. If the report contained a hyperlink to the specific image or a thumbnail version next to it, the clinician could double click the hyperlink or the thumbnail and be immediately directed to the appropriate key image. Weiss says this type of function would add context to radiology reports. It could also promote a measure of goodwill between the radiologist and the referring physician. Although some would say that the RIS should direct all this traffic, Weiss says in practice, the RIS is usually more helpful for technologists and billing. While some radiologists think of their PACS workstation as their command center, Weiss prefers to use his reporting space for that purpose. He says more decision-support and reporting assistance could save a significant amount of time and add context on every read. He cites mammography as an example of how he envisions the process. Computer-aided detection (CAD) is used in mammography as a decision-support tool for detecting calcifications and possible cancers. When a radiologist looks at a mammogram, it may have CAD markers denoting areas of interest. The radiologist can drag those markers off the screen to dismiss them or verify the ones that he or she wants to report. Weiss sees this as an opportunity for more effective reporting. If such a process were used for all types of radiology exams, the efficiency would be even greater, but it’s hard to say how long it will take for these advancements to penetrate radiology practices. 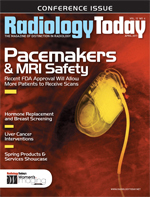 Five years ago Weiss discussed a “future ideal” radiology reporting and communicating system. He says that about one-half of what he viewed as a future ideal five years ago has already been accomplished. He notes that when maximum efficiency will be achieved depends on how “maximum” is defined. He estimates that, five years from now, his wish list will progress from the current 50% complete to approximately 90% complete.